July 25 - This is why we go to Croatia! We made it home and are happy to be reunited with our family and friends. I am extremely tired and ready to shut the eyes for about a great 8 hour night sleep. It is 4 in the morning in Croatia and my body is fighting to go to sleep and I am waiting as long as possible, but losing the battle. Thanks so much for the prayer support and financial support you have provided! I will give you a wrap up some time tomorrow when the body has rested and can better cope with this time zone. History and Baseball was the call for the day on Friday and it was great! The Croatian national team took on Poland to play for the chance to take on Lithuania for the championship on Saturday afternoon. After the morning game where Lithuania beat Slovenia Saleim, Grant, Heidi, Erin and myself walked over to Stari Grad, the old fort to get a history lesson in late 1500 history. Shannon and Brandon went to check on the shipment which was promised to us yet another day! That will make 5 tomorrows since we first knew the shipment was on this side of the pond. It has been frustrating to deal with the government and with a new government in place the rules to seem to have changed yet again but still no one can tell us really what those rules are or how to go about getting anything approved or processed. The history of the fort was neat to walk around the walls and to realize how old it was really was mind blowing! 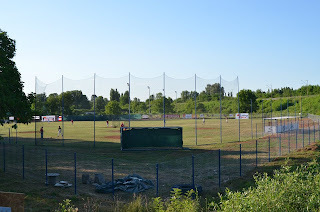 2012 opening day for the European National Qualifier Tournament! Opening evening for the Field of Faith evangelistic outreach events! Wow, it is finally here! Hard to believe and to see the transformation of the field and the stage is absolutely incredible! Started this once and somehow lost it in cyberspace so will try again. Monday was a prep day to get everything done and ready for the European Qualifier Championship that is to begin on Tuesday! You know you are doing accomplishing God’s plan when you have 5 Storks praying without hesitation, in fact one of them suggesting we do it, with several mission team members in huddle on the sidewalk on 2nd Street in downtown Sisak! With arms around Jason and Katie, along with Brandon and myself, Joseph, Mario, Allen, Elvis, Stefan prayed for the mission and Jason and Katie’s safe return home! He and the other Storks expressed their thanks for coming and being a part of this ministry and how much they appreciated their love they showed! This was a wonderful end to a great day and a beautiful evening of walking around the city! Yesterday was a travel day. We left Split around 12:30 and headed back to Sisak. It's about a 5 hour trip. We took Laurence (one of the Zagreb Patriots players) with us to Zagreb. He was very appreciative - he was going to have to take the bus. We had room because Brandon stayed back in Split to spend time with his wife (who is flying out on Saturday), friends & missionaries, and to do some follow-up from the football camp. We dropped off Laurence in Zagreb, and then got back to Janko's in Sisak about 5:30. Janko was here, and we got a chance to show Jason & Katy around (this is their first time in Sisak.) We walked around the city and (of course!) went to Rat Man's to get our dose of sladoled (ice cream!) We turned in early so that we were ready get a fresh start on the field Friday - getting the field & stage ready for the big European National Qualifying Tournament next week! I guess I'll start recording my blogs again since I re-broke a knuckle on my right ring finger. This is a knuckle I broke 10-12 years ago trying to catch a football! I'm sitting out on the patio in Split before we head back to Sisak this morning. We're leaving around 10:00 - please pray for our travel there. We're going to be taking a Zagreb Patriot with us. Laurence is his name - he's actually from America (from Kansas) so it will give us a chance to share with him on the road trip. We've got about a 4 1/2 hour trip back to Sisak. I'm looking forward to that - just praying for safety. Things are going great here in Split. Yesterday was another incredible day. We finished up the Sea Wolves Football Camp, and it went very well. We had to go an hour early (6:00 instead of our normal 7:00) because another team had already scheduled the field. It was a little warmer but still a great time. Today was an awesome day! We got everything done that we needed to accomplish. It started to rain this morning but after breakfast the sun came out and there wasn't a cloud in the sky! Praise God for HIS mercy. Heidi and Grant got the dugout painting done while Erin and I painted the seats in the locker room. I just want to say again what a joy it is to work side by side with my daughter and serving the Lord together is a blessing! It is very hot here so we took a long lunch then of course, had ice cream on the way back to the field. Heidi and Grant are hard workers and I enjoy spending time with them. Not sure where to start in the events of the day. The blessings we have received are so overwhelming that it is hard to capture them all in words on paper or in cyperspace, but I will try my best to share all that God is doing through this ministry in the past 24 hours! From meeting other missionairies who are on the front line of ministry on a regular basis and being encouraged by them and hopefully us encouraging them in the process to playing football with so many eager young men who are open and receptive to listening to every thing we say. We were blessed with God revealing that not only are these young men eager to hear about football but they are receptive to hearing about God’s love for them as well! Watching all those eyes of the 35 players involved in the camp glued on Jason while he gave his testimony, was incredible to witness! Today we got an early start on the day. We had breakfast and devotions at 7 so we could be to the field by 8. Erin and Shannon worked with Timi putting a second coat of paint on the stage. I really enjoyed working with Erin again and having Timi is a blessing. The extra set of hands are really helpful! 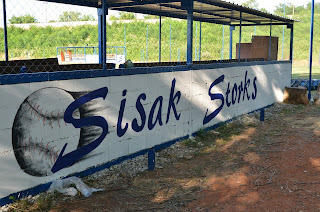 Grant and Heidi painted the Sisak Stork's name on the back of one of the dugouts. Grant came up with an amazing idea. We bought parchment paper and traced the letters for the second dugout. That cut the drawing time in half for Heidi. Way to go Grant! We came back to the house for lunch. It was very hot today so we hung out here for a while then went back to the field at 4. Erin and I touched up the stage paint and Grant and Heidi got the letters drawn out for the other dugout. Blog-Monday July 9 If God is for us who can be against us. United we stand together with Him as our leader, protector, provider and strength and man has HE delivered on every occasion and with each step! What a wonderful Monday and the chance to share His truth at the football camp as well as walk through 2000 years of history was breath taking, not to mention the beauty of His creation here in Split. The day was absolutely incredible! Please read on but I must warn you ahead of time, if you move on you may be moved to come and join us next year on this ministry here in Croatia! Having the chance to share in Sisak over the past 7 years has been incredible and now to break through and having the chance to share here is mind blowing! God is showing us his plan on a daily basis and although many of our plans we make don’t come about we realize he is in control and as long as our focus remains on Him he will provide all the direction and strength needed. Sunday, July 8th Heidi went to church in Zagreb with Kristina. They spent the day together. Grant, Erin and I cleaned the house and changed all the sheets on 10 beds and did all the laundry. Then we went out for pizza. We had a great time of fellowship and we enjoyed cleaning the house together. It was a quiet night with just the 4 of us here. Timi is visiting from Germany and it's great to be able to spend time with him. 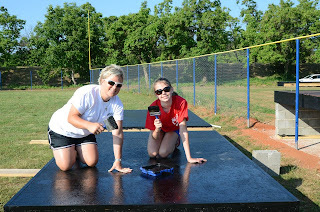 Heidi and Grant have been working on the painting at the field. Grant has been painting the dug outs white and Heidi has been drawing the logos on the backs of the dug outs. 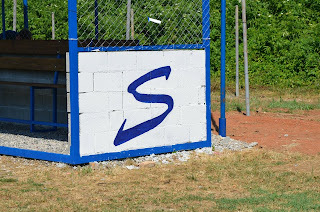 The "S" is done on both side of one of the dug outs. Tomorrow, Heidi will finish the drawing of the logos and get the painting started. Grant was putting a second coat of white on the dug outs to get the surface ready for Heidi's artwork. Friday- Shannon shared with you all the nursing home experience and how blessed they all were with playing songs, doing crafts and just spending time loving on these older people. For some of them this was the first time they had ever met an American and the love in the eyes for us was incredible. 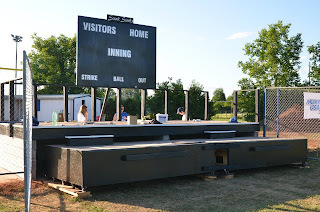 As I mentioned in the last message, the stage project is really coming along! I finally got to spend some time working and it felt good to swing a hammer and enjoy some time together with the construction crews. And although I took a swing and hit the wrong nail a time or two, being there was a joy!